In the sixth response from the Bishops’ Benches to the Queen’s Speech, the Bishop of Carlisle, Rt Rev James Newcome, focused on health matters, drawing special attention to the need for action on elderly social care and on the health aspects of proposed legislation on modern slavery. He also criticised some Trusts for the recent significant reduction in chaplaincy hours. 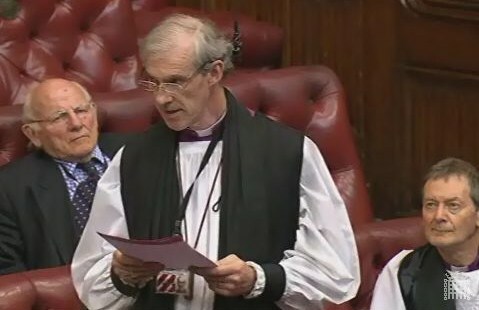 The Lord Bishop of Carlisle: My Lords, I agree with the noble Lord, Lord Willis, that the quantity of legislation does not equate to its quality. As we have already heard, we doubtless all agree that the noble Earl, Lord Howe, and the NHS deserve a bit of a rest. However, there are none the less those who regret the fact that so little of the gracious Speech related directly to health. For instance, the charity Age UK expressed its disappointment that an opportunity was lost to put in place safeguarding legislation that would have helped prevent the abuse of older people. Certainly, as the noble Lord, Lord Patel, has already reminded us, the statistics are shocking. Every hour, more than 50 older people are neglected or abused in their own homes by family members, friends, neighbours or care workers. In the course of a year, that means that about 500,000 older people are abused in the UK, which is 5% of the older population. In addition, the General Medical Council is concerned about the lack of any reference to the regulation of health and social care professionals Bill. This is regarded by many as a once in a generation plan for much needed medical regulation. The GMC observes that if the Bill does not pass before the general election next year, it will be a significant missed opportunity. I agree and hope that we may receive some assurance on this point. However, like my friend the right reverend Prelate the Bishop of Derby, I am delighted that the modern slavery Bill was highlighted in the Queen’s Speech. We have already heard that many others in your Lordships’ House share my enthusiasm for its various provisions. In particular, I am grateful that law enforcement will be better equipped to prevent the distressingly widespread incidence of modern slavery and note the proposed increase in penalties for perpetrators of slavery or trafficking. There is also a promise that the Bill will provide statutory guidance on victim identification and victim services. That is excellent, but it raises three health-related issues to which I will draw your Lordships’ attention. First, there is the question of potential payment by immigrants for NHS services. This could be used by traffickers as yet another lever in their exploitation of today’s slaves. I hope it may be possible to disseminate a very clear message—for instance, through posters on buses and tubes, television advertisements and so on—that trafficked individuals will not be penalised for attending healthcare facilities. Secondly, over the past two years, there have been some instances of people being trafficked for the harvesting of their organs. Your Lordships may know that the churches have been working closely and successfully with the NHS to increase numbers on the organ donor register. That campaign has included making next of kin more aware of their relatives’ intentions. This campaign needs to continue and should help militate against organ trafficking, but there will also be a pressing need to alert the public and health professionals to this nefarious trade. Thirdly, with regard to victim identification, NHS staff may often be the only point of contact that trafficked individuals have with society. That is why it is so essential that front-line staff are properly trained to recognise the signs of trafficking, not least in children. Of course, the healthcare professionals who are sometimes best placed to do this by virtue of their wide-ranging brief and their interpersonal skills are hospital chaplains. This is just one of many reasons why the significant reduction in chaplaincy hours by some trusts seems to be short-sighted and ill advised. There were some other health-related issues in the gracious Speech which warrant attention and raise important questions. For example, while there is a welcome extension of free school meals, which will improve the health of thousands of children, it is not at all clear where the age cut-off will come. No doubt further detail will be forthcoming in due course. While paying tribute to the magnificent work done by so many in the NHS, I trust that the relative lack of emphasis on health in the gracious Speech will not mean any diminution of attention by Her Majesty’s Government to the huge and crucial issues that we all face in this area.